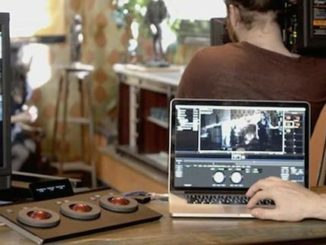 If you’ve been waiting for a great deal on a host of Red Giant Software apps, how does 40% off sound? Today is the day to pull the trigger, as the company is holding its annual End of Year flash sale. Today is YOUR day! 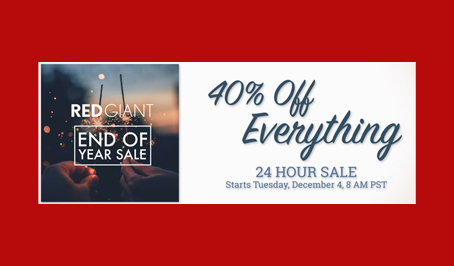 Red Giant’s annual blockbuster end of year sale is now live…quite literally everything in the redgiant.com online store is 40%. This includes full products, upgrades and the academic store. Additionally, Red Giant has the annual subscription for Universe on sale at 40% off, at $199. Moreover, there are other subscriptions that are currently listed at a low price over the MSRP. 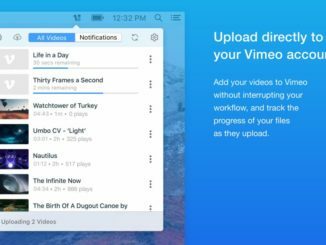 The benefit of the annual subscription is that users will have new features and fixes automatically updated throughout the year, so you always have the latest tools at your disposal. 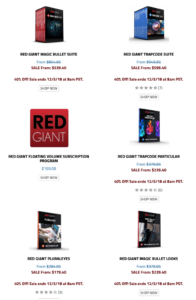 But you have to act quick, as the Red Giant Software sale ends on Wednesday morning, December 5th at 8am. Also over at Tool Farm, there is a sale going on for the plugin RenderGarden. 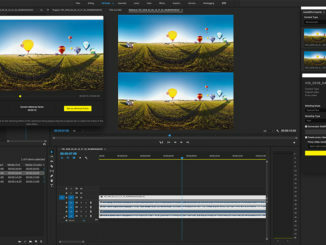 This plugin promises to increase your render speeds in Adobe After Effects by 300% by using multiple cores in a networked configuration. RenderGarden is on sale for $30% off through December 5th.